Happy new year 2015 everyone, I hope this year will be better than last year and fill with wonderful things, I'm looking forward to share more recipes with you all and thank you to all of you who follow me on Riceandcoconut Facebook page and all readers around the world, I had amazing year 2014, Once again happy new year 2015 Cheers ! To readers who have a new year resolution to eat healthy or become vegetarian or vegan this fried rice recipe is for you, so enjoy and keep cooking and stay healthy. soy and sweet soy sauce,stir and cook thoroughly,until combine. 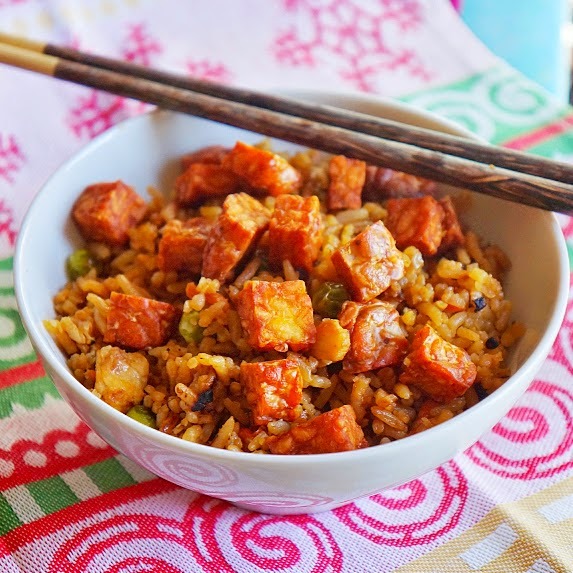 I love tempeh, but haven't tried it in fried rice yet. It surely looks very delicious and comforting. wow, what a creative idea!!! not even once cross my mine, damn delicious!! !